Sallie has done all the landscape design on my 1/4 acre lot. We were working with a blank slate, but we still had lots of challenges such has drainage issues, shade, and a sloping front, side and back yard. She created a complete plan that we could implement in phases that met all our needs Our plan includes multiple patios, retaining rock walls, privacy planting, decorative planting, walkways and a driveway. 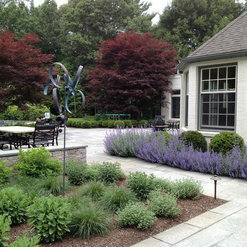 Sallie did an exceptional job creating interesting and functional hardscapes and plant beds. Sallie is professional, dependable, and fun to work with. She is knowledgeable and respected in her trade. I loved working with her and look forward to continuing to work with her as we finish each phase. Sallie is super easy to work with. She has created a very beautiful design for my home combining her knowledge of what works and what doesn't with my wishes for plants and color. I highly recommend her as she is very responsive and reasonable. She was able to listen to my vision and turn it into a plan that is beyond what I imagined. Last year we decided it was time to give our outdoor space a completely make over. Our yard is a quite challenge because it’s unleveled & very shady. All we knew was that we wanted a low maintenance Zen garden. Sallie listened carefully of our requirements & came up with a wonderful design plan. Sallie patiently answered all my questions & concerns. During the discussion period, I realized that I could totally trust Sallie with the whole project. 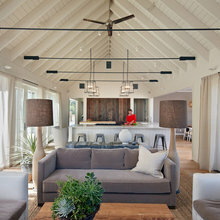 She handled everything including choosing the contractors, scheduling & working with the contractors for the installation. Also, she kept us in the loop on each step. The whole project went smoothly. Now we have this beautiful Zen garden that we can relax in each day. I cannot stop staring into my garden while I’m doing the dishes. Thank you, Sallie, for the job well done! We finally can enjoy your beautiful outdoor space. 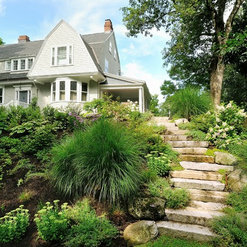 Sallie delivered a fantastic project that completely renovated our landscaping. From the RFP process through design and execution Sallie was a consistent communicator and her ability to translate our ideas into practical implementation was outstanding. We love our new property and would highly recommend her to friends and family. Thank you so much. I really enjoyed working with you and Katie! 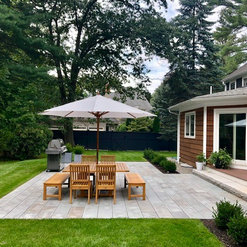 Sallie designed our entire out door space- heated pavers driveway, bluestone walkway, outdoor kitchen, outdoor patio, ipe deck, lawn and plantings. She also procured any town zoning approvals for the decks/structures. 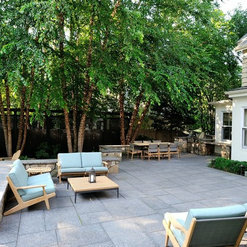 She is truly amazing and the outdoor space is beatiful. We recently had the pleasure of working with Sallie Hill for a full landscape design and implementation project for our home. 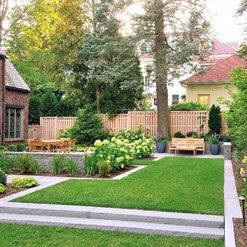 We have a 95 year old bungalow on a 15,00 square foot lot that needed a full landscape design plan and implementation. We were looking for a design that would compliment the archectiure of our home, integrate with the existing landscape, and provide an inviting outdoor space for our family. 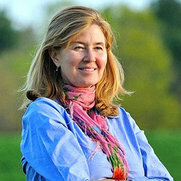 Sallie's professionalism, relaxed approach to problem solving, and expertise made the project go smoothly. Sallie has very high standards for the implementation, which allowed us to be off site with ease. We were very comfortable relying on her judgment for execution of project details. Thorougout the project, Sallie was available and consistently provided status updates. Sallie has a great eye for plant selection and solving problems for existing site constraints. She was able to extend the usability of our lot in a space where others may have overlooked the possibilities. Sallie's plant selection took into account the abundance of rabbits in our neighborhood, the light constraints, and our desire to incorporate a variety of seasonal beauty. Our project is now complete and the end result is beautiful! 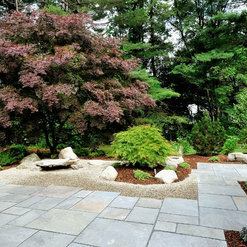 The landscape and hardscape look timeless and beautifully compliment our home. 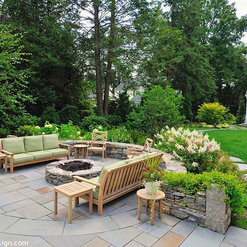 I would recommend Sallie without hesitation for both landscape design and implementation. 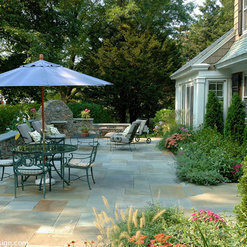 We hired Sallie to design a plan for our yard and to oversee the installation of the hardscape and trees. Sallie is extremely professional and easy to work with. She was very willing to meet with us regularly regarding the plans and regarding the installation of the project. Her contractors were also lovely and did a great job in collaboration with Sallie. We are so pleased with how our project turned out and recommend Sallie very highly. We are so pleased with Sallie's design! She transformed a couple of steep unruly pieces of property that lie on either side of our new garage into beautiful landscapes. She is a skilled designer and a thoughtful listener. The garden itself was planted in the fall, so it wasn't until spring (now) that we could really see and appreciate the full impact of Sallie's magic. I am so tickled with my new little dogwood tree. Every day I marvel at it's gorgeous pink flowers. Sallie was wonderful to work with -- she accommodated our budget and particular tastes, she was reliable and always met deadlines, and she was ever patient and kind. We can't recommend her highly enough! 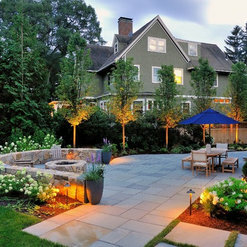 Last summer I hired Sallie Hill Design to create a plan for my yard. I wanted her to give me some ideas for making my back yard more easily accessible from the front yard as it is on sharp incline, and for reducing the muddy areas where the back yard is muddier in the spring. At the same time we wanted fresh planting ideas, a buffer from the road and plans for a new driveway. Sallie spent a lot of time with me throughout each step of the design. She came up with two initial sketches and we met to talk them through, after which she generated a comprehensive design based on our discussion. The work will be done in stages and because of Sallie, I have a clear sense of how to proceed so that each aspect of her design is completed successfully. This spring we will begin phase one of the work, I enjoyed working with Sallie and expect to continue to use Sallie Hill Design as a consultant during the working process. Sallie is great to work with. Through pictures and my explanations, she quickly got a sense of what we like. She came up with some really great ideas that we wouldn't have thought of to make the most of our space. Sallie was timely and very easy to work with. We love the plan she came up with and cannot wait to see the finished product once the snow stops and the project can being! 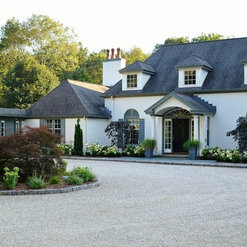 We worked with Sallie to create an overall design for our whole property, including privacy plantings and a large patio. Sallie was a true pleasure to work with! Her design is beautiful and she carefully considered our budget and requests throughout the process. We can't wait to see it all come together! I was really pleased with Sallie Hill's work. 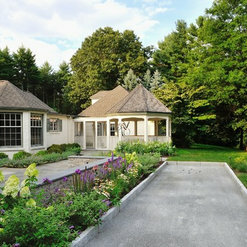 I had completed a home renovation and as a result, needed to redo the landscaping from scratch. Sallie is a great listener (she takes into account what you like and what you don't) and offers up ideas that you have not even thought of. For me, that meant adding some nice lighting features to the property. She does great design work, is easy to work with, and follows through very well. I love the final results and would highly recommend her. Commented: who built this house?It was a renovation of an existing house by the homeowner, so unfortunately I do not know who built the house. Commented: Can you tell me who's trench drain this is? and is it set in concrete?The grate is a 4&quot; wide Locust pattern from Iron Age Design. The grate is set into a NDS plastic trench drain and the jumbo granite cobbles are mortared into place on either side.